Frequent variations in throughput make mobile networks a challenging environment for video streaming. Current video players deal with those variations by matching video quality to network throughput. However, this adaptation strategy results in frequent changes of video resolution and bitrate, which negatively impacts the users' streaming experience. Alternatively, keeping the video quality constant would improve the experience, but puts additional demand on the network. Downloading high quality content when channel quality is low requires additional resources, because data transfer efficiency is linked to channel quality. 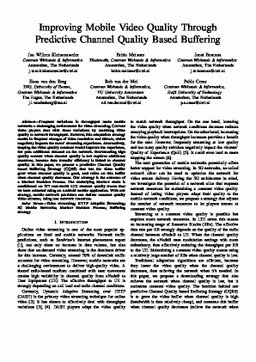 In this paper, we present a predictive Channel Quality based Buffering Strategy (CQBS) that lets the video buffer grow when channel quality is good, and relies on this buffer when channel quality decreases. Our strategy is the outcome of a Markov Decision Process. The underlying Markov chain is conditioned on 377 real-world LTE channel quality traces that we have collected using an Android mobile application. With our strategy, mobile network providers can deliver constant quality video streams, using less network resources.